South Sound Solar and Sound Native Plants help shape a more sustainable region and society. Kirk Haffner ’88 and daughter Dever Kuni ’12 are combining science, education, and business sense to expand solar energy use in the South Sound. Last November, the Olympia Timberland Regional Library unveiled its latest addition: a shiny new power station mounted to the top of its roof. Constructed of 33 Washington-made solar panels and inverters, the system generates enough free energy from the sun to produce 8,000 kilowatt hours of electricity a year, helping to run the downtown building, shave its annual electric bill by $800, and earn $4,000 in utility incentives. South Sound Solar, a leading Olympia solar consulting and installation firm owned by Kirk Haffner ’88, helped plan, design, and construct the solar demonstration project, made possible by grants from Puget Sound Energy’s Green Power Program and the City of Olympia. “We were very excited to work on a project that affects our city and state so positively,” said Haffner, president and lead engineer of the small family business, which has played an outsized role in promoting the regional expansion of solar energy. In 2013, the company was listed as a top U.S. solar contractor by the trade publication, Solar Power World. And this past April it won recognition for taking significant steps toward sustainability by Thurston Green Business, a partnership program of the Thurston County Chamber, Thurston County and the cities of Olympia, Lacey, and Tumwater. Through their outreach efforts, both Haffner and his daughter, company vice president Dever (née Haffner-Ratfliffe) Kuni ’12, are active in advancing the awareness, understanding, accessibility, and affordability of solar power as a superior alternative to fossil fuels. Haffner, a former science teacher and Intel engineering manager with a graduate degree in physics, guest lectures at Evergreen (this year in E.J. Zita’s Energy Systems and Climate Change program) and he regularly presents “Solar Power 101,” a nuts-and-bolts educational workshop around southwestern Washington. A frequently addressed topic is the viability of solar power in a cloudy region. “Even on overcast days, our solar system is producing,” said Haffner about his own property’s panels. In the workshops, he explains the mechanics of how solar power works and points out that the world’s leading solar market, Germany, has fewer sunny days a year than western Washington. Kuni—who earned her bachelor’s degree from Evergreen with a focus on sustainable business administration—is a co-founder of the newly formed Solar Installers of Washington, a trade association and solar power advocacy group, where she was recently named legislative and public policy chairwoman. “I was nominated because I was crazy enough to say politics is fun,” she said. She’s also involved in other community organizations including the local chapter of the Northwest EcoBuilding Guild and the Thurston Climate Action Team. In April, she was appointed to the Olympia City Council’s Utility Advisory Committee. Haffner was a member of Evergreen’s inaugural 1986 Teacher Education Program (the prototype of the Master in Teaching Program). An inventor at heart and a longtime solar enthusiast, he experimented with the technology as a teenager, once heating his family’s above-ground swimming pool in Fall City, Wash., by making a solar hot water panel out of a living room storm window, to his parents’ chagrin. “When the pool got above 80 degrees and my mom went in, she wasn’t so mad after that,” he quipped. Since 2008, when Haffner created South Sound Solar, he and his crew have installed hundreds of photovoltaic and solar hot water systems throughout the 60-mile radius it serves. With its 13 employees, the company focuses mostly on residential installations, but it has also done municipal and commercial work, including at the library, two branches of Olympia Federal Savings, Eastside Big Tom, Old School Pizza, and the NOVA School. They recently conducted a feasibility study for adding a six-panel photovoltaic demonstration system to one of Evergreen’s student housing Mods. Currently, the sun generates only a fraction of a percent of Washington’s electricity. But solar’s outlook is bright: the state’s net metering program—which allows customers to trade excess power produced by their systems with utility companies for credit—and other incentives have spurred a growing local market. In the past year alone, South Sound Solar has completed an average of five installations a month. That benefits the local economy and environment, said Kuni, which is a big part of South Sound Solar’s mission. She and her dad look forward to continuing to help people go solar, creating green jobs, and doing satisfying work. “We know we’re in a business that’s making a difference,” she said. For centuries, the banks of Ohop Creek provided habitat for creatures such as muskrats, beaver, and elk. The creek, a major tributary to the Nisqually River, meandered naturally across its glacier-carved valley west of Mount Rainier. Its salmon runs were estimated in the tens of thousands. Alexander prepares plants for restoration projects. When dairy farmers settled the lush bottomlands during the late 1800s, they turned the shallow, winding creek into a deep, straight-flowing ditch in an attempt to dry out the valley to improve grazing for their cattle. For the wildlife, plant life, and salmon, the change was devastating. In 2002, the Nisqually Indian Tribe and other stakeholders in the watershed began a decades-long effort to restore Ohop to its former glory. Olympia’s Sound Native Plants has played a role in replacing the floodplain’s century-old pastureland with its older native vegetation to reestablish a healthy riparian habitat where fish and wildlife can once again flourish. The results have been positive: salmon stocks are increasing and animals including elk, which had not been seen in the area for decades, have returned. That was a surprising, but welcome, development for Alexander. 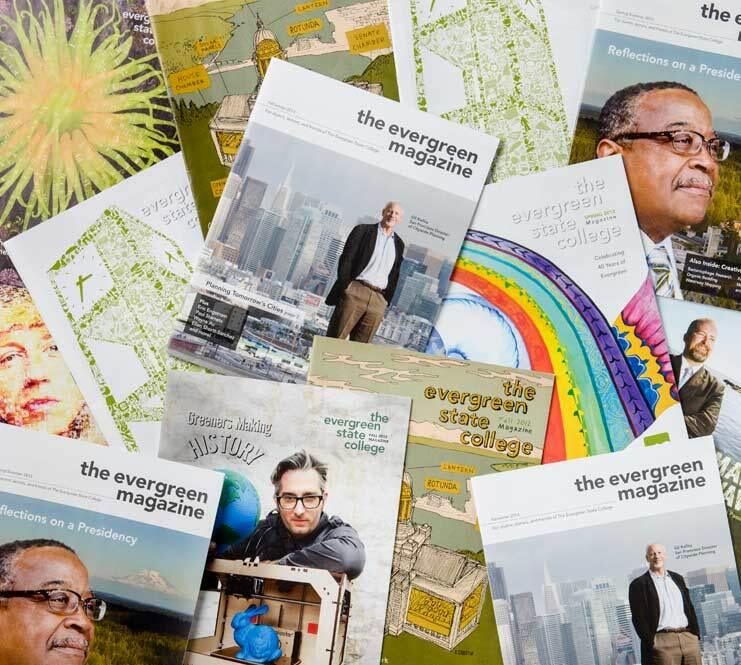 At Evergreen he studied political science, community organizing, environmental planning, and in his final year, he took the Energy Systems program. He wanted to pursue a career in the clean energy sector. Once he graduated, however, a recession and the Reagan administration’s gutting of Jimmy Carter’s multi–billion-dollar alternative energy initiatives effectively dashed his plan. Ben Alexander ’82 and Susan Buis ’83 helped pioneer the ecological restoration discipline. “There was awful unemployment at the time and I couldn’t find a job,” he said. So he took whatever came up, including a paid internship and a position at a plant nursery in Shelton. “Pretty much anything I could to survive,” he said. He also spent a lot of time in the Olympics and Cascades. A visit to North Cascades National Park, where a friend from Evergreen was interning with the Student Conservation Association, changed everything. A project to reestablish native vegetation was occurring in the high alpine meadows of the park’s Cascade Pass, which had been trampled to death by visitors. That work turned out to be historic. “Cascade Pass was the granddaddy of all ecological restoration in the Northwest,” said Alexander. Alexander has worked steadily in that recovery process for more than two decades, gaining experience in a wide variety of ecosystems from eroded shorelines to steep mountain slopes. This longevity was made possible in large part by launching Sound Native Plants, which was founded in 1992 because Alexander and Buis were frustrated by the lack of opportunities to keep working in the field. “We realized that if we wanted to keep doing it, we’d have to do it on our own,” said Alexander. Since then, the company has been an influential force in restoring the integrity of ecosystems throughout Washington and Oregon. It has grown millions of native plants and helped return tens of thousands of acres of damaged habitat to health. Its list of clients is long and includes federal agencies, cities, counties, tribes, schools, corporations, nonprofit organizations, and private landowners, with public agencies making up the bulk of its commissioned work. Along with offering all the services necessary for successful restorations—from growing, planning, designing, and permitting to installing and maintaining—the company is committed to education. It shares its expertise via its information-packed website, as well as through publications, workshops, talks, and training. Located on a two-acre property less than two miles from campus, Sound Native Plants has provided internships and work-study opportunities for nearly 200 Evergreen students over the years.